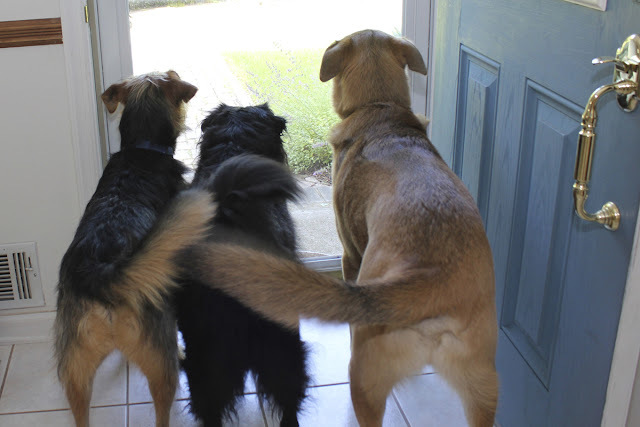 Home / Dog tails / Why Do Dogs Wag Their Tail? Dogs use their tails in pretty much the same way humans use their hands. Both hands and tails are used by humans and dogs respectively to communicate and to express themselves. Of course, communicating is easier done by humans. Our furry friends also use other parts of their bodies to impart their message. Apart from tail wagging barking, whining and growling are used by the dog to communicate. Tail wagging, however, is commonly used. Dogs wag their tails more than any other animals with tails do. Notice how dogs would wag their tails when they meet another dog. This is their way of saying "how are you?" and very similar to the handshake of humans. With the wagging tail, dogs can communicate and understand each other even at a distance. Dogs with relatively short tails communicate with the human family, with other dogs and animals by using other parts of the bodies like the head and the ears. Aside from being a form of communication, tail wagging also conveys the emotional state of the dog. Commonly, a wagging tail signifies happiness and a friendly attitude. The dog would certainly gladly meet the owner with a wagging tail. The wagging tail, in this case, denotes the good spirit of the dog. The dog may be asking the owner to play with him or entreating the owner to give him a treat. However, a wagging tail is not an ultimate sign that the dog is friendly. Take care in approaching a strange dog even if it is wagging its tail. Many people get bitten by dogs this way. Dogs are extremely social animals. They rarely wag their tails when they are alone. In the presence of the alpha male, a dog wags its tail as a sign of submission. In this instance, the tail is held low and wagged stiffly. A tail that is held high with only the tip wagging is a sign that the dog is aggressive and showing his dominance over another dog in the pack. Dog experts theorize that tail wagging may also mean that the dog is in conflict. The tail that wags from side to side is a sign that the dog is confused whether to go or to stay.